Spiders in Tuscany (Italy) - Are there dangerous toxic spiders? Many holidaymakers who travel to Tuscany and other regions in the south of Europe are afraid of dangerous and poisonous animals. Again and again there are questions about poisonous snakes and spiders, sometimes also about scorpions, wolves in Italy and other more or less dangerous creatures. This page is about poison spiders in Tuscany and surroundings. Information about poisonous snakes in Tuscany can be found in this article. How many poisonous spider species are there in Tuscany and Italy? This is a question that is not easy to answer. 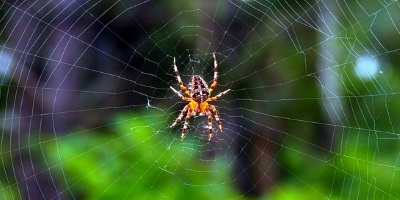 There are far more than 1,000 different spiders (web spiders) in Italy. Almost all of these species are poisonous, many are found in Tuscany. But not all species are dangerous for humans. Most spiders in Italy and other regions of Europe cannot penetrate the human skin. Many spider species have a weak poison for humans and / or a very small amount of poison. We have found in the literature in Tuscany about 3 to 5 species of spiders that can seriously injure people. Deaths from spider bites are extremely rare in Europe. The world’s most dangerous spiders live mainly on other continents such as America, Australia, Africa and Asia. Below are some examples of known toxic spiders in the center of Italy. This spider belongs to the approximately 30 species of real widows worldwide. Many of these spiders are very poisonous. The very dangerous „black widow“ (Latrodectus mactans) is known in the USA, according to statistics about 5% of bites lead untreated to death. 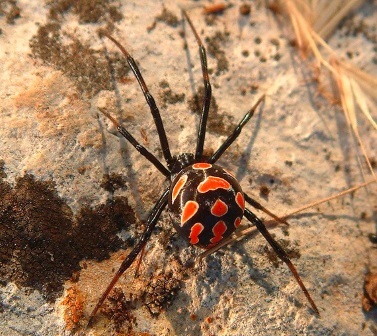 In Tuscany lives the „European Black Widow“ (Latin: Latrodectus tredecimguttatus). This spider is somewhat less dangerous and less poisonous than the American spider species. Nevertheless, the bite should not be underestimated. According to statistics, about one in 200 bitten people dies. Other data in the literature speak of a higher probability. Other sources also claim that a bite from a European black widow is generally not fatal. This could be a European black widow. Although the spiders of the species European Black Widow are not exactly rare, there are few bites on humans. Often they are workers in agriculture, the Black Widow also likes to live in greenhouses. The poison spider species can be found in almost all of southern Europe (Spain, Italy, the Balkans, Greece, etc.) and in many parts of Asia. Caution: The bite of the European Black Widow is described in most literature sources as not painful at the beginning and is therefore often underestimated. This spider is also simply called „Thorn Finger“. 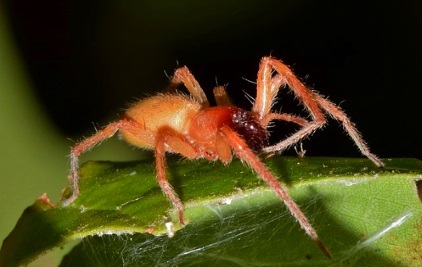 The bites of the spiders can be painful for humans, but are rarely life-threatening. Although Yellow sac spider occur in large parts of Europe (especially in warm regions), poisonous bites on humans are rare. The thorn finger spider is rare in Germany, in Italy and Tuscany it is much more common. This could be a spider of the species Ammen Thornfinger. Despite its name, this tarantula spider can be found not only in the region of Apulia, but also in central Italy and southern Italy, including Tuscany. The poison spiders live in caves, which they dig themselves and are up to 30 cm deep. The animals themselves have a diameter of 3 cm (only the body), with legs clearly more. They belong to the largest spiders in Europe. the poisonousness of tarantulas is enough to kill mice and birds. For humans, the amount of the poison is usually not sufficient to be life-threatening. A bite of the Lycosa Tarantula is often described in literature as a bee sting or wasp sting. There is a danger of allergic reactions. Every person reacts differently to poison. Individual bee stings can also be life-threatening for people with an allergy. Many people feel disgusted by the large, hairy tarantulas. You find this spider species rarely in Tuscany. Names: German: Apulische Tarantel ; in other languages the spider is mostly known under the Latin name „Lycosa tarantula“. We would like to point out once again that dangerous attacks by spiders on people in Tuscany and throughout Europe are very rare. The danger of being injured or killed in a traffic accident on holiday, for example, is statistically much greater. Whether there are also other, big tarantulas in Tuscany, we could not find out for sure. In the south of Europe there is the tarantula species „Ischnocolus valentinus“. These bird spiders live for example in large parts of North Africa, Spain and in the south of Italy including Sicily, Calabria and Campania. The spiders of the species Ischnocolus valentinus have also been seen in and around Naples and Rome. We could not clarify whether they also occur in (southern) Tuscany. We did not find any reports about them.